Good Looking Outdoor Vinyl Banners. We’ve been away from the site for a while. We apologize. If you really want to know what’s up with us on a weekly basis, you need to be checking our facebook page anyway. Hey! 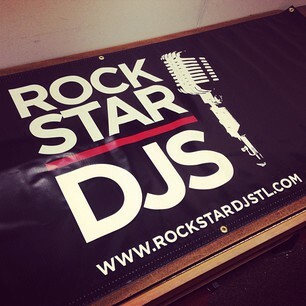 Look at this sweet banner we just made for our friends at RockStar DJs! They have a big event this weekend at the St. Louis Mardi Gras Festival in Soulard, spinning some tunes in the Bud Light party tent!